MEPMatch | Laruco LLC. Smart Software Development. 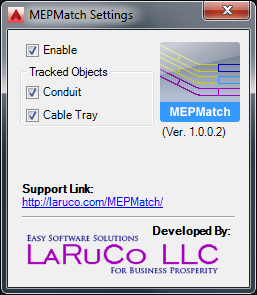 MEPMatch plugin for Autodesk® AutoCAD® MEP. By default in Autodesk® AutoCAD® MEP conduits and cable trays are either assigned a default conduit system layer key or current layer depending on AutoCAD settings. It is a labor intensive and time consuming process. MEPMatch plugin redefines how electrical systems are being created and modified insuring greater process reliability and efficiency. It has innate ability to insure uniformity of project CAD standard, simplify design and coordination review and maintains construction document fidelity. It allows to maintain and increase the level of detail assigned to electrical raceway as your project evolves.